The experienced racing driver Bertrand Godin will be competing on the Trois-Rivières race track during the GP3R Formula 1600 races presented by Toyo Tires, which will be held on August 10th and 11th. 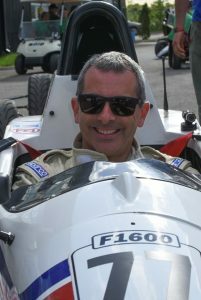 Considered to be the favorite historic series of Trois-Rivières to Grand Prix fans, Bertrand Godin will be back for this prestigious race aboard his Mygale Britain West Motorsports. Bertrand was ranked 4th at the Grand Prix of Canada last June and hopes to repeat this feat by going above and beyond by relying on a solid strategy and a car with the highest performance. Godin will therefore renew with the Mygale, a car that he is already familiar with due to his 1993 and 1995 performances using one of these French cars when he took part in the French Formula Ford Championship which led him to being the second runner-up of the event. For the race, Bertrand Godin will proudly be wearing the colors of his partner, Groupe À l’infini, who has just joined the driver’s team for the GP3R races.